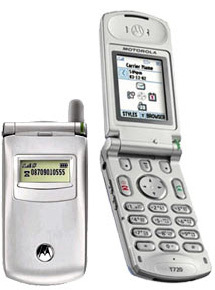 The Motorola T720 is the GSM sister phone to the T731 CDMA phone that I tested a couple of weeks earlier. They are extremely similar in all respects except for their air interface, and so much of this review is borrowed directly from the T731 review. There has been considerable discussion concerning the build quality of this model, but the one I had a chance to play with seemed to be quite solidly constructed. It had a solid feel when squeezed, the fit-and-finish were quite good, the flip had little or no play, and it didn’t creak unless I put an insane amount of pressure on the hinge (which isn’t a good idea anyway). It certainly seemed to be markedly more solid than the V60 models. As for the color screen, it was a bit of a disappointment. It wasn’t particularly bright, and the colors seemed washed-out. I’ve personally seen far better color screens on other phones I’ve tested recently. To its credit, it is actually visible in direct sunlight, though not as brilliantly as the screen on the Siemens SL55. Unfortunately it still needs the backlight when outdoors if the sun isn’t shining directly on it. The earpiece has a very comfortable feel against my head, and I could certainly see myself using such a design for prolonged phone calls. It was markedly more comfortable than the Nokia 3595. The size of the phone also puts the microphone in close proximity to my mouth, which paid dividends when it came to outgoing sound quality (as I will discuss shortly). Too bad Motorola hasn’t seen fit to update their menu system. While it was a step in the right direction two years ago when phones such as the P280 came onto the market, it was hardly perfect. Obviously such changes occur very slowly at Motorola, which isn’t necessarily a good thing for the end user. RF performance was a bit disappointing, in that it had noticeably more trouble hanging onto the signal when tested back-to-back against my Nokia 6310i (both phones operating on Rogers GSM). The T720 would begin to suffer from debilitating audio damage well before the 6310i showed any signs of trouble. To be fair however, the difference here wasn’t as bad as some GSM phones I’ve tested in the past, such as the Motorola V66, but it was poor enough to give me pause. I had expected better things from Motorola. Incoming sound quality wasn’t too bad, but it was hardly a match for the 6310i, or the old Motorola P280. Still, tonal balance was only slightly hollow, and nowhere near as bad as the T731. Sound reproduction was excellent, and earpiece volume was acceptable, even on Rogers (which has a lower audio level than Fido). Outgoing sound quality was very good, and it was easily a match for the 6310i. The T720 obviously benefits from having the microphone closer to the user’s mouth than a typical candy bar phone. Background noise was well muted, and overall sound reproduction was also very clean. Tonal balance was very good.